Federal pipeline safety regulations require pipeline operators to conduct continuing public awareness programs to provide pipeline safety information to stakeholder audiences, including the affected public, emergency officials, local public officials, and excavators. Federal pipeline safety regulations 49 CFR 192.616 and 49 CFR 195.440 require pipeline operators to develop and implement public awareness programs that follow the guidance provided by the American Petroleum Institute (API) Recommended Practice (RP) 1162, "Public Awareness Programs for Pipeline Operators" (incorporated by reference in federal regulations). Under these regulations, pipeline operators must provide the affected public with information about how to recognize, respond to, and report pipeline emergencies. The importance of using the one-call notification system prior to excavation is to be emphasized for all stakeholders. Emergency officials and local public officials must be provided information about the location of transmission pipelines to enhance emergency response and community growth planning. Affected municipalities, school districts, businesses, and residents must be advised of pipeline locations. Of particular significance is the requirement that operators must periodically review their programs for effectiveness and enhance the programs as necessary. 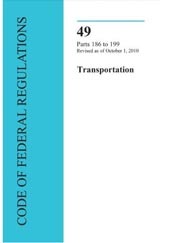 The 2005 Final Rule modified pipeline safety regulations found in 49 CFR 192.616 and 195.440. More information can be found in the Federal Register Notice in which the rule was issued. Most recently, PHMSA issued a final rule on December 13, 2007, that relaxes regulatory requirements governing public awareness programs conducted by operators of master meter systems and certain operators of petroleum gas systems. This final rule took effect January 14, 2008.